We are very saddened to hear that one of the greatest graphic designers of our age, Ivan Chermayeff, passed away on 3 December. 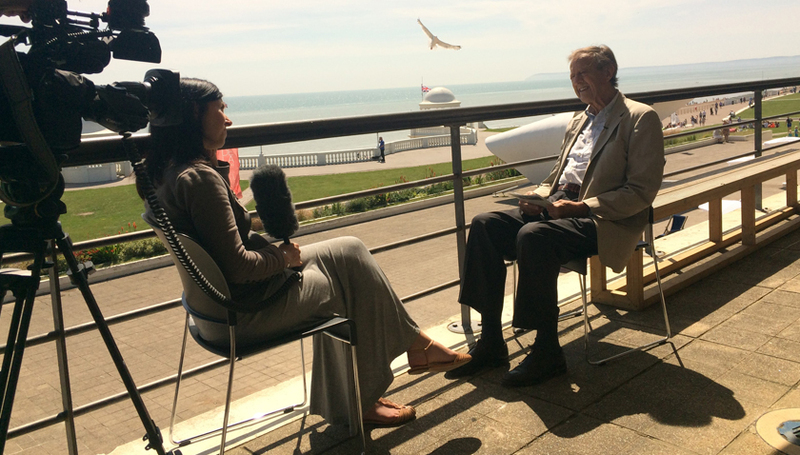 As the son of Serge Chermayeff, the architect who with Erich Mendelsohn, designed the De La Warr Pavilion, Ivan was a friend and Patron to the Pavilion until his death, generously creating our 80th Anniversary logo in 2015. Credited with being one of the founders of the modern profession of graphic design Ivan’s agency, Chermayeff & Geismar & Haviv was responsible for some of the most iconic logos of the 20th century, including PanAm, Mobil, NBC, National Geographic and MOMA to name just a few. In 2014 we were thrilled to exhibit some of his more personal work in our ground floor gallery in an exhibition called Cut And Paste, bringing together three generations of Chermayeffs; the exhibition was designed by his son Sam together with his partner Johanna Mayer-Grohbrugge in the building designed by his father. This was Ivan’s first UK exhibition and toured to Peninsula Arts, University of Plymouth and to London College of Communication as part of the London Design Festival. The work in the show reflected his obsession with collecting scraps – crumpled envelopes and crushed tin cans, scraps of billboards and torn newsprint, all assembled to form strange animals and abstract faces. 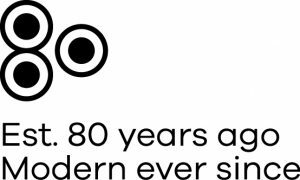 We then invited Ivan to design an icon for our 80th anniversary, and he presented us with a very simple, three circle mark (see below) which was used on our print material and made into beautiful and much coveted pin. We remember Ivan as a very generous and warm character with an extra-ordinary outlook on life. It was a thrill to watch Elvis Costello with him and the family in the concert hall designed by his father, and to be able to take him to his childhood home Bentley Wood, where amongst others Frank Lloyd Wright took tea on the terrace. See above Ivan Chermayeff returning to Bentley Wood, his childhood home designed by his father, with our trustee Sean Albuquerque. Our thoughts are with Ivan’s family.